Fargo 45029 half-panel ribbons are used for printing a combination of half-card color images and whole card one-color text or barcodes. Fargo 45029 half-panel ribbon refills include half-size yellow (Y), magenta (M), and cyan (C) panels, for printing full-color images. The full-size resin black (K) panel is used for printing text and barcodes, and the overlay (O) panel is a thin protective panel that is applied to the card surface. Fargo 45029 half panel ribbon refills include Y, M, and C half panels and a full-size resin K and clear O panels. A cleaning roller is also included with this ribbon. 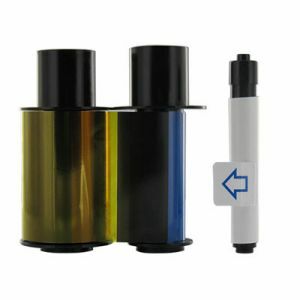 Fargo 45029 ribbons are compatible with Fargo C50, DTC1000 and DTC1250e printers. Half-panel ribbons allow you to print color on up to half the length of a standard CR80-size PVC card, while resin black may be printed on any area of the card. If you're only printing full-color on part of your cards, Fargo 45029 half panel ribbons allow twice the normal ribbon yield than a standard YMCKO ribbon, at a lower cost per card.